Good question! Even so, it pleases me to share with you the concept of boondocking from my personal findings (both by experience and research-wise). So in the actual sense, what does boondocking mean? In simple terms, boondocking is basically camping in uncivilized or undeveloped areas without hookups. Things like water, shower, sewer, conventional power/electricity supply, garbage etc. In some instances, you may have also heard of it being referred to as dry or dispersed camping. Whichever way, boondocking is obviously a great way to get away from cities, traffic, and crowded campgrounds. This is a way that you can surround yourself with nature in its purest or quintessential form. By doing this you’ll also have the opportunity to save a good sum of money on lodging while doing so. Furthermore, the main question that you’ll have to ask yourself is whether or not boondocking is right for you. That said if you really enjoy being in the great outdoors and don’t mind going without a few amenities. Then this just might be a perfect match for you. 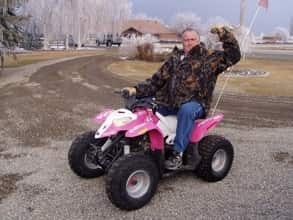 If you prefer to be surrounded by neighbors and recreational activities you might be more comfortable in a traditional campground. If you’re not ready to fully commit to the idea of camping without necessities like (running water, public restroom. This is just to mention a few you could choose to do a combination of both camping styles. That way, you surely will get the best of both worlds; (Even in terms of comfort, a free, fully endowed and immersive wilderness experience). Going forward, it is also imperative for you to concentrate, and focus your impacts on the heavily used areas. Reason because? A good number of areas that are easily accessible do receive, heavy usage during the summer months. Remember, if there’s a fire ring at the camping area, do not build or erect a new one. That would sometimes mean you might have to clean out the old fire ring. So you don’t want to forget the collapsible shovel. We all have to play our individual role to keep these areas open and clean and accessible to other people. We want to try and do this for others who would also prefer this type of experience. The Rest Of This Article Is About Boondocking While Getting To The Great Outdoors Where The Real Boondocking Is. Here is some important information you will need to know so you can have a good boondocking experience. 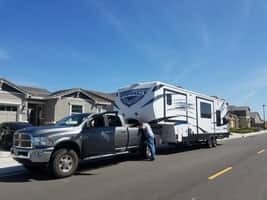 A good number of retailers (the likes of Walmarts, etc) do have an existing or standing policy that allows boondocking. But however, always make sure and confirm or check with an authorized individual or manager or owner. This way you know whether it’s okay or not to park your RV in their parking lot for the night. But while you’re at it, also be sure to ask about any rules that they would like you to obey. On the other side, if you plan to boondock around any state-owned ground or facility. Make sure to seek permission and guidance from the regulatory agencies (i.e National Forest Service System, BLM etc). It is known that many businesses have existing posted rules or policies regarding how the parking lot can be utilized. That being said, always be sure you read the regulations with utmost care whenever you stop for the night. 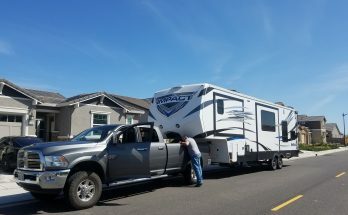 There are times when RV (Recreational Vehicle) travelers and diesel truckers must vacate or clear out by a specific time. This is usually at a specified time in the morning (for instance) so they can clean the parking lot. Otherwise, they are required or expected to park in certain specified sections of the lot. Yeah, regardless of how nice or cool it is to have a free place to park your toy hauler while boondocking. The very last thing you should do or even have on your mind is to – overstay your welcome or visit. Of course, it is generally known and understood that boondocking is a ”one night only” setup or arrangement. 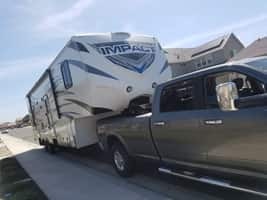 But however, in many areas it is quite possible to find or locate multiple places where you could park your motor home overnight; (perhaps as a way to help/enable you to cobble something together). While this practice is certainly not, required, or expected. That said, be sure to make a point of stopping inside so you could check things out. Then if you need some things you might as well buy some stuff in a way to show your appreciation. It is imperative to note that while boondocking, you’re obviously just supposed or expected to park for the night. Specifically for you to get some sleep or rest). Even so, some campers make a point of taking up as little space as possible. So make sure you don’t bust out the grill, table, chairs, awning, whatever. Kindly leave everything packed away so you can get moving right away the next morning. Besides, your property and belongings may not be safe if left unattended in a lot. Hydraulic jacks are capable of causing damage to parking lots – even to asphalt materials. You should always avoid using yours while boondocking with your class motor home or other RV vehicle. It may be a lot less comfortable, but on the other hand, you don’t want to damage their lot. The last thing you want to do or think of is to damage the business’s parking lot. Especially after they showed you so much hospitality and let you park on their parking lot. More specifically, you shouldn’t just avoid or do away with littering while boondocking. You obviously should make a concerted or deliberate effort to leave your space cleaner than you found it. This is a great way to show retailers that RVers are excellent guests with every sense of the word. Even so, it increases or raises the odds that they will continue to allow people to boondock in the future. So prior to your leaving or vacating the scene, always make sure you clean up any litter that you see or notice. You should also avoid leaving a trace, mark, or sign that indicates you were there. However, you can clearly see that proper boondocking etiquette is mostly about being a good, conscientious guest who upholds values. Also remember, you are being allowed or granted the rare privilege to park on someone else’s property for free. So don’t make them regret it by breaking the rules of that were highlighted above. a) Where Can Someone Boondock For Free? 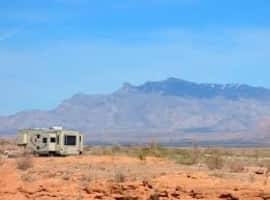 Having knowledge of specific public lands that allow free camping – makes locating or finding a free boondocking campsite much easier. Some reliable websites do have pretty good guidelines on a number of public lands that allow dispersed camping. This is precisely camping anywhere on public lands, outside of a campsite. That said, Bureau of Land Management lands (BLM) and Forest Service lands – (for the most part of their dealings), do allow dispersed camping for up to fourteen (14) days. Likewise, Wildlife Management Areas also often permit or allow it. But however, always be sure to check and confirm you don’t need a permit (In other words – there are no restrictions). Meanwhile, also remember to consciously keep an eye out for “no camping/lodging signs” too. Furthermore, National Parks are often too crowded to permit or allow dispersed camping. But some do allow backcountry dispersed camping also check whether or not you would need to obtain a free permit. In some cases, you might luck out or be lucky enough to find out that the park where you’re staying or lodging has a free, developed campsite. As usual, ensure you check the BLM and Forest Service websites to locate or find such. That said, you may even need to do some hiking at subsequent times, but it is well worth it. In addition, you also might be able to find or locate a City or County park with free camping feature. More often than not, these places will advertise this package – if available. Regardless of where you plan to stay, always take advantage of the Internet to do as much research online in advance – as you possibly can. You can also get tips/information on what amenities a particular site may or may not have, how populated or crowded it might be, etc. On the flip side, if you’re considering or planning on tent camping, also double and triple check that you virtually have everything you need. Also note that these free campsites are often pretty far off the grid, and finding a place with supplies might be a pain or somewhat hectic. b) What Does It Mean To Boondock In An RV (Recreational Vehicle)? The term RV means Recreational Vehicle they come in many different styles and brands, lengths as well as types.